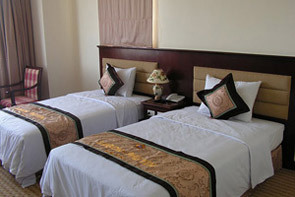 Saigon Phu Yen Hotel is located in the heart of a beautiful city Phu Yen. 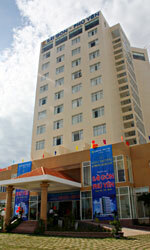 It is a 10-storey-hotel with much influence of Oriental architecture. 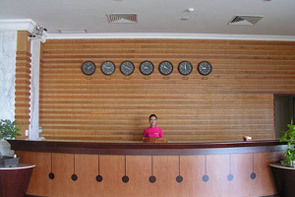 Thanks to the convenient location of nearing the airport and shopping centers, Saigon Phu Yen hotel is one of the most convenient and comfortable hotels in Vietnam which can be stayed during your precious time in Phu Yen. Moreover, the modern and luxurious room furniture as well as the warmth and welcome of hotel staff will make you never forget when on Vietnam holiday or business. Guestrooms are features modern Oriental decor with rich patterned fabrics and teak wood furnishings. All offer air conditioning, wireless Internet access, satellite television, direct dial phones, mini-bars, and safes. Bathrooms have separate bath and showers, bathrobes, slippers, hair dryers and complimentary toiletries. 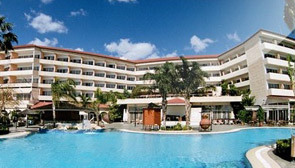 Guests who travel Vietnam have chance cool off in the outdoor pool with an adjacent pool bar. Business facilities include one big conference room and 3 meeting rooms. Practical amenities include a car park, a 24 hour front desk, all hour\'s room service, and a multilingual concierge service. The Restaurant offers a number of dining options: Lotus Restaurant serves traditional Vietnam food in a modern, Oriental setting with specialties including Draised eye\'s Tuna with Reddate, Squid hot Pot. Moon River Bar & Restaurant serves modern Italian dishes in an elegant, romantic setting with panoramic city views, River and sea view. 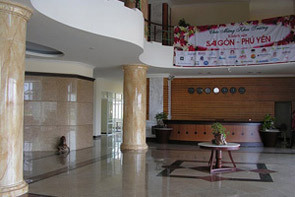 Ground floor Sai Gon Phu Yen serves garden coffee and light lunches, all with complimentary wireless Internet access.